Our relationship has lasted through years of moving, career changes, long distance graduate school, and finally with a proposal last year. 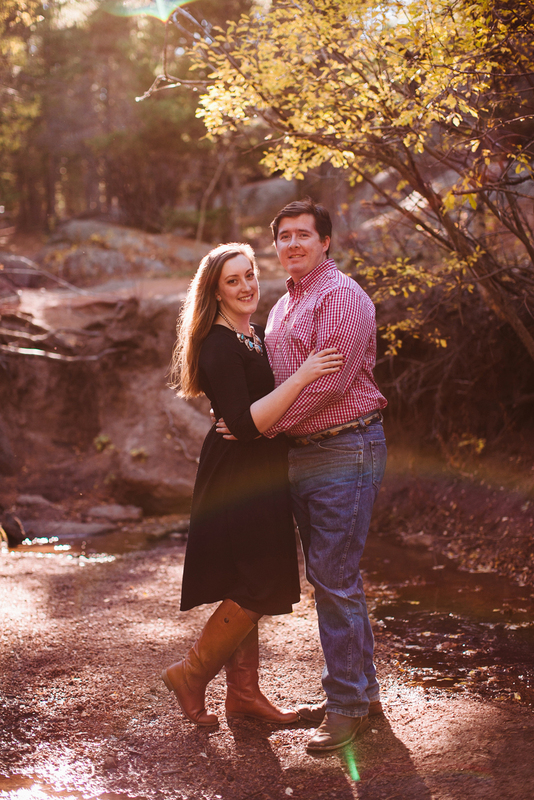 Who knew that two kids from Wyoming, who only grew up 45 minutes from each other would end up together? We now live in Houston, Texas and both work in the oil and gas industry. We try come to Wyoming as often as we can and after we got engaged last year I knew we had to come home for a weekend fall photo shoot in the mountains where we grew up. Our entire wedding planning process has been very us- and on our own time. I want every aspect to feel intimate and personal. When Matt proposed last year just the two of us on a snowy mountain hike, no cameras or surprise guests, it was beyond perfect. My ring is a stunning pink sapphire in rose gold- the most unique ring I have ever seen. Matt knew I wanted something very different and he did not disappoint. Our engagement shoot was filled with romantic touches and classic style. I wanted our engagement photos to feel whimsical and charming, with all the love and warmth of an afternoon mountain adventure. Very us! 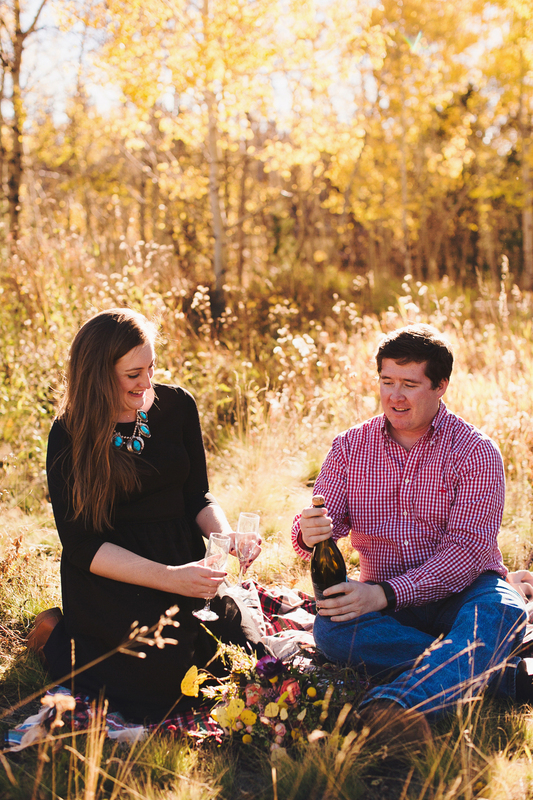 We used to head to the mountains all the time when we were dating, so grabbing a bottle of champagne and a cozy blanket for our shoot brought back so many memories. The day was perfect, we did not need any jackets and the breeze was still a little warm. We were very lucky because some seasons, the snow comes early and we both hoped to get the last of the fall colors. Our shoot took place near Laramie, Wyoming in a place called Vedauwoo (sounds like Vee Da Voo), where the rocks and landscape is magical. There are were golden aspens, sage, rivers and streams with plenty of intimate spots to sneak away to. We had such a great time sipping champagne and climbing the rocks, it was like no time had passed at all. We feel most comfortable in more casual outfits but I was sure we had western inspired touches like cowboy boots and my vintage squash blossom style turquoise necklace. My dress is a textured material with an Aline cut from ASOS and Matt wore a fall colored Brooks Brothers button down. I loved adding little details here and there- The long stemmed champagne glasses, plaid blanket, and a fresh bouquet of wild flowers. The bouquet had hints of fall colors and was the perfect detail, I felt like a bride carrying it. 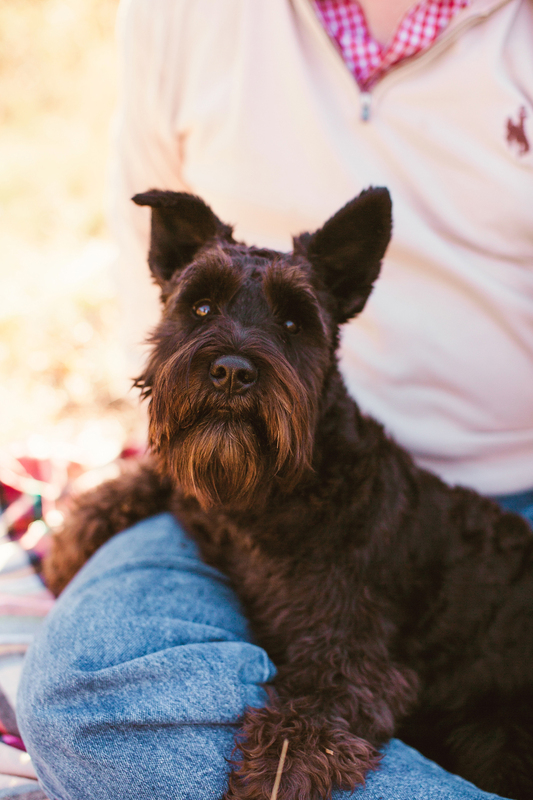 Our shoot would not be complete without our handsome miniature schnauzer puppy Arthur. He just had his first birthday and loved getting to tag along. Our photographer Liz is a wonderful friend of my sister's who has the most incredible portfolio and she knows the entire mountain range like the back of her hand. She knew exactly the feel we wanted and the right locations to capture the fall atmosphere. You can see how talented she is! The sunlight and the autumn colors make the golden afternoon come to life. Our photos are natural and sweet- I am over joyed! My best advice to a newly engaged couple- take the time to enjoy being engaged and celebrate! 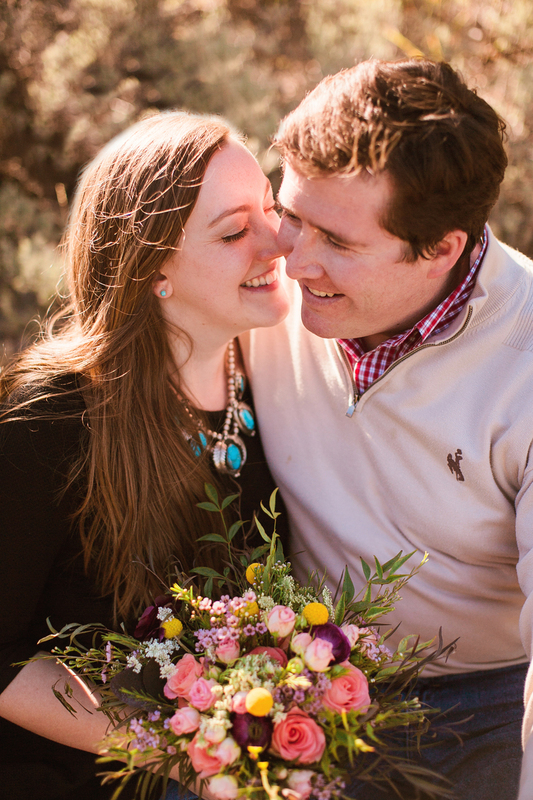 Don't hurry into wedding planning mode and miss out on the sweetness of being engaged. Drink champagne one night just because or take a small trip to relax as you plan. Remember you are not just planning a wedding event, but a life together. Give it the time it needs!